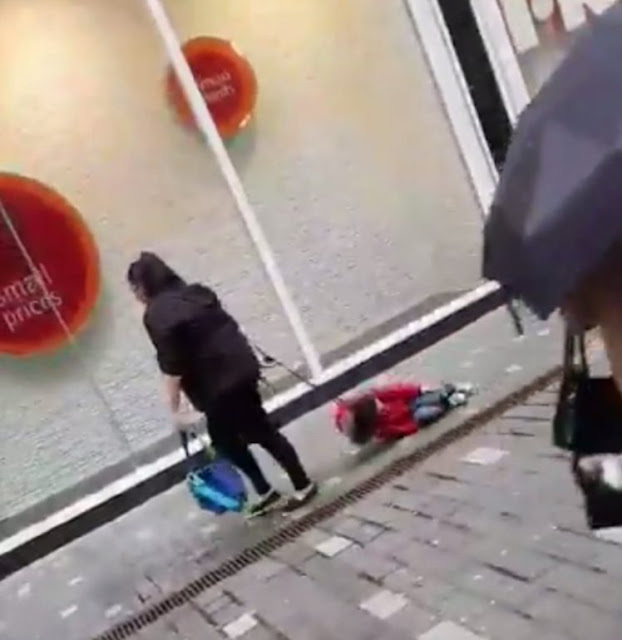 A woman filmed dragging a child along a pavement in Liverpool city centre has hit back at haters, insisting she’s ‘not a bad mum’. Footage of the mother pulling the young boy along the street went viral after a shocked passerby shared it online yesterday. It led to dozens of people criticising the mother and questioning why no one intervened. But the mum-of-one, who does not want to be named, slammed people for judging her parenting ‘before they know the situation’ as she explained that her four-year-old son has severe autism. She said: ‘My son has autism, he has meltdowns and throws himself on the floor. ‘What I am doing in that video is the only way I can move him. He does it all the time and won’t get up or let me pick him up. He just drops to the floor like a sack of spuds.’ The 31-year-old mum said it had angered her that her son had been compared to a rag doll and people’s suggestion that he had fallen over and she had not picked him up. She added: ‘People are making me out to be a bad mum – I am not a bad mum. They should ask before they judge me. Only two women came up to me and I said ‘he has severe autism’. The single mum, who lives in Liverpool, said her son, who was diagnosed with autism when he was two, reacts badly to being around crowds of people. She said: ‘I can’t go out very often because he has these meltdowns. He doesn’t like big crowds and whenever I take him out he could just kick off. ‘People don’t understand how hard it is having an autistic child, especially when they are so strong. He has attacked me before and knocked me off my feet, but he doesn’t know he is hurting me. ‘He can be the same with his friends. It is very stressful.’ She added: ‘He isn’t a naughty child, he has autism and he is very loving and people just look at me like something is wrong with him. ‘I have the reins on him because he has no sense of danger. 0 Response to "Woman filmed dragging son along pavement gives her side of the story "